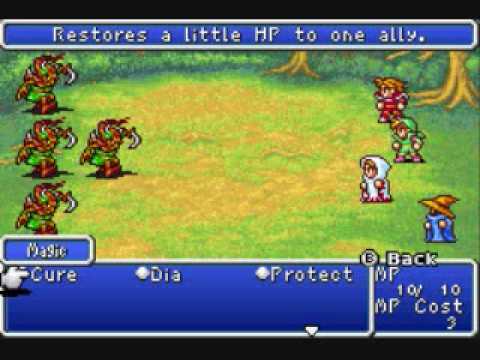 I start my journey with Final Fantasy Origins, FF 1. Grindfest galore. This game is tough, unforgivingly tough, but only because I wasn’t used to the old school toughness. I died multiple times, where it sends you back to your most recent save. Every death making me lose 20 minutes of gameplay, it adds up. I don’t fault the game though, it’s my fault because I push the “just one more battle before heading to town to heal” and then I die. The plot is very simple, creatures have started appearing and the warriors of light will come forth to save the world, each carrying a crystal. That’s all I know. To note, this is a remake of the original Final Fantasy’s 1 and 2. They have been redone in a 16-bit style. The music holds up really well, and that Iconic first scene where you cross the bridge into the unknown for the first time still packs that emotional impact of excitement and adventure. I’ll be using a FAQ for this game, I’m not young anymore and don’t want to spend time wandering around while getting hit with new battles every few steps. Although I do try to go on my own at first. I start off in the middle of nowhere, just me and three companions, Near me is a town and castle, I decide to explore the world a little bit, and battle different types of enemies. They look like goblins and they pack a punch. When this is done I head over to the town, purchase new equipment and head to speak to the king. The king’s daughter, Sarah is missing, the king asks me to go save her, in exchange he will fix the bridge to the north of the kingdom, allowing us to continue out adventure. That’s exactly what I do too, I save the princess from Garland and head to the king with the good news. The king keeps his word and the bridge is rebuilt. We cross the bridge and the now Iconic signature Final Fantasy theme plays. Great graphics, great music and a good sense of adventure. Frequent, every few steps triggers a battle sequence, lack of story. PREVIOUS POST Previous post: Playing every Final Fantasy title, and rating them, can I actually do it?